And so Lynn, who is also a professor of architecture and urban design at UCLA, has been using the Microsoft HoloLens at the U.S. Pavilion for this year’s Venice Biennale. Assigned the Packard Plant, a historic half mile-long abandoned car factory in Detroit, Lynn and his firm were tasked reimagining the site. 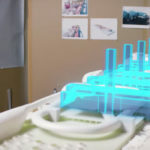 The HoloLens, which is aided by tech firm Trimble’s mixed reality technology, allowed Lynn to holographically visualize and navigate the space. “It actually changes the way you think about design” said Lynn, who added that the lens meant he could fully comprehend the scale of the site, something which he achieved by placing twelve Tate Moderns into the area, by virtual means. According to Lynn, the technology also allowed him to make decisions regarding design and spatial qualities much earlier than usual. “Without the HoloLens, I would have been making those decisions three, four months from now, but with the HoloLens, I’m making those decisions at the point of inception” said Lynn. 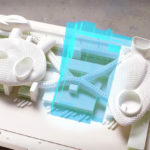 The HoloLens can also be shared with clients, allowing architects to use the language of space to show why certain design decisions were made. “Using this technology I can make decisions at the moment of inception, shorten the design cycle and improve communication with my clients,” added Lynn. AN got a chance to test out the device at the Venice Biennale last week. The use of Hololens in exhibition design is very useful in displaying the US Pavilion proposal. Visitors can see the history of the site holographically projected on the physical model, complete with diagrams that display change from year to year, tracking the growth and decline of the Packard complex. The technology also allowed the exhibition to be annotated with information about the design, as well as animations that made it come alive with images of drones and puffing smokestacks. “HoloLens is going to bridge that gap between the two-dimensional and the three-dimensional and physical space…. It’s a revolution,” Lynn concluded. If you want to get your hands on a Hololens, they’re only $3,000. According to Microsoft’s website, the device features sensors, a processing unit, special high-def color lenses, and built-in speakers. 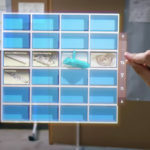 Microsoft is also collaborating with Lowe’s, the home improvement company, to help customers visualize new kitchen or living layouts, finishes, and more.